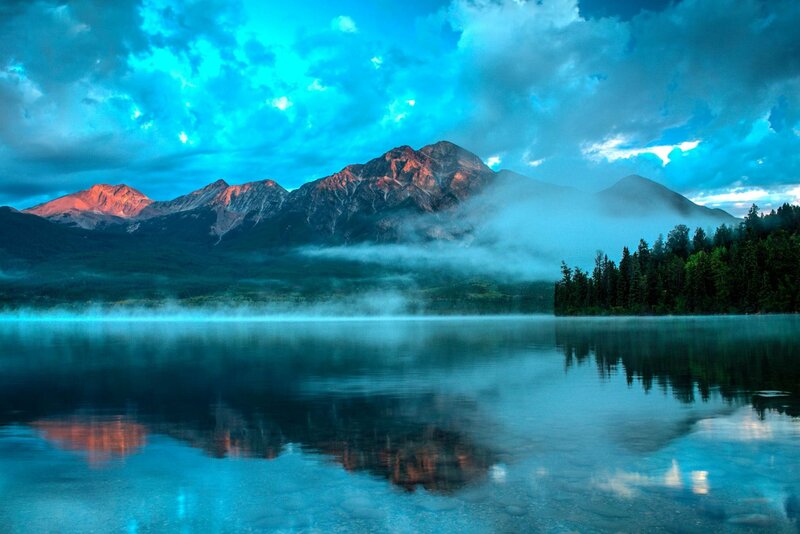 Jasper National Park is the northern sibling of Banff, situated in the middle of the Canadian Rockies. With gorgeous, jagged mountain peaks, vast evergreen forests, and sparkling teal lakes, it’s basically any landscape lover’s dream come true. A trip to Jasper is a real treat for the senses; when I first arrived there, I couldn’t believe that these magical, dramatic landscapes were actually real. And the incredible Jasper accommodations are no exception. As they always say in travel (or maybe it’s just me), where you stay can make all the difference in how your trip goes. Luckily, Jasper accommodations range in comfort and price to match any type of traveler or budget level. One thing to note about hotels and accommodations in Jasper (and all of the Canadian Rockies): they sell out SUPER quickly. Like, months in advance. So if you’re planning a trip to the Canadian Rockies, I STRONGLY recommend booking cancellable accommodation on Booking.com. In this post, I’ve hand-picked a few amazing places to stay in Jasper for each budget level, from luxury lodges to rustic backcountry campsites. If you’re wondering where to stay in Jasper, read on for the juicy details! Sunrise views on the banks of Pyramid Lake. Wouldn’t you like to wake up to this every day? Imagine staying in a cozy, A-frame style cabin with giant windows looking out over evergreen forests and snow-capped mountains. At the Fairmont Jasper Park Lodge, you can have it all! This high-end resort has over 400 beautifully-decorated guest rooms and cabins that you can use as a base for exploring Jasper’s surroundings. Their rooms and cabins are spacious with large windows, and come with high quality linens and toiletries. Aside from the rooms, the Fairmont Jasper Park Lodge has a heated outdoor pool AND a hot tub, perfect for relaxing after a long day of hiking or skiing. There’s also an upscale restaurant that serves local Canadian fares, a golf course, and a luscious spa with relaxing treatments. If you’re wondering where to stay in Jasper to have luxury at your feet, the Fairmont Jasper Park Lodge is a fabulous choice. Of all of the Jasper hotels, this one is definitely one of the nicest and most comfortable. Compare prices for Fairmont Jasper Park Lodge or book Fairmont Jasper Park Lodge now on Booking.com. 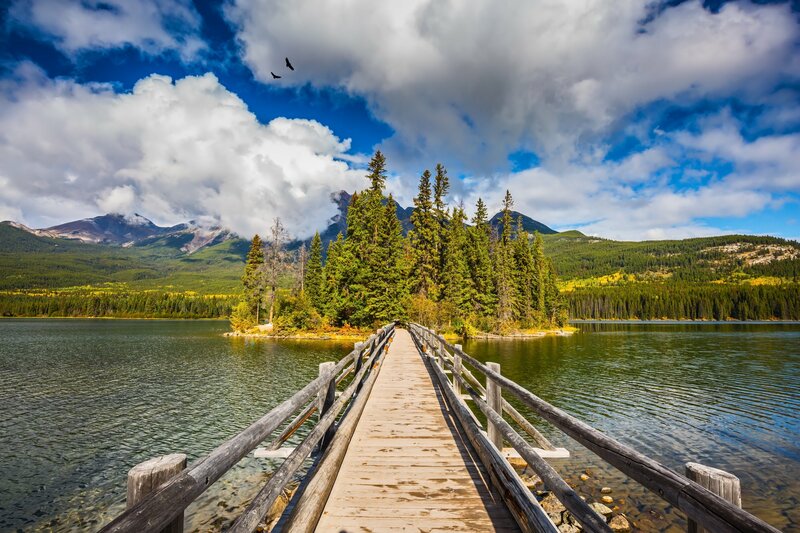 For adventure travelers and cabin lovers alike, the Pyramid Lake Resort is one of the best places to stay in Jasper. It’s a picturesque lodge located on the shores of Pyramid Lake (Does it even get any better than that?!). This beautiful property is great for couples or families that want a more secluded kind of resort experience, with stunning views of Pyramid Mountain and the surrounding peaks and lakes. One of the best things about Pyramid Lake Resort is that it is right next to the vast and beautiful Pyramid Lake, and just minutes from nearby Patricia Lake. In addition to stunning sunsets and sunrises, there are also pretty amazing adventure activities that the resort can help organize, including kayaking, canoeing, and more. On the resort’s grounds, there’s a family-friendly restaurant, a sauna and hot tub, and even horse drawn sleigh rides in the winter! There are plenty of hiking trails surrounding the lake as well for travelers itching to get outside. Compare prices for Pyramid Lake Resort or book Pyramid Lake Resort on Booking.com. Views from Sulphur Skyline: one of the many hikes you can do starting near Overlander Mountain Lodge! For reasonably priced, resort-style digs, Marmot Lodge is a fantastic choice. Located on the outskirts of Jasper town, this full-service lodge is on our list for its reasonable prices, which are considerably lower than at its peer resorts in the city. However, it’s also one of the more popular places to stay in Jasper, so be sure to book early if you want to get a room. While the property and rooms are a bit more dated than other resorts, it also doesn’t have as high of a price tag. Rooms are clean and spacious and come with classic hotel amenities like high-quality linens and toiletries. At the resort, they have a pool, hot tub, a gym, a restaurant, and a concierge service that can help with booking tours and excursions. It’s also walkable to Jasper town center, where you can find a wide variety of food and shopping options. Compare prices for Marmot Lodge or book Marmot Lodge on Booking.com. For one of the most beloved places to stay in Jasper that doesn’t break the bank, the Overlander Mountain Lodge is a consistently well-rated lodge on the outskirts of Jasper National Park. 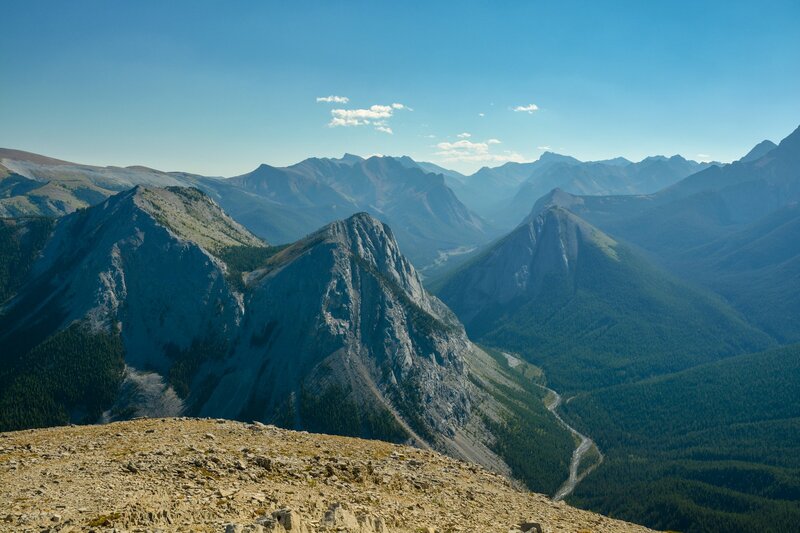 While it’s a 30-40 minute drive from Jasper’s town center, the Overlander Mountain Lodge is a prime location for exploring some of the area’s hiking trails, as well as the Miette Hot Springs. Because of its more remote location, the Overlander Mountain Lodge can usually be found for ~$100 per night (a total steal in Jasper, by any standards). And, if you have a car, it’s just down the central road in Jasper, so it’s not a difficult drive by any means. The resort has private rooms, cabins, and chalets for rent, and boasts two onsite restaurants and a brewery for a refresher after those long Jasper hikes. Compare prices for Overlander Mountain Lodge or book Overlander Mountain Lodge on Booking.com. Let’s be real – the Canadian Rockies are NOT an easy place to travel on a budget. However, you can save a lot of money on Jasper accommodations by a) booking in advance and b) staying in a hostel (dorms or private rooms). If you’re open to the hostel life, here are two great options for you in Jasper. Arguably the best of the budget Jasper accommodations, the Jasper Downtown Hostel is a backpacker’s oasis in the heart of downtown Jasper. This is the best Jasper hostel in our opinion, and is definitely worth looking into for your trip to the park. With dorms at ~$35 USD per night and private rooms for a bit more, it’s a fantastic, clean, and cozy budget option in a fabulous location. The rooms have big, ensuite bathrooms and central heating/AC to make sure you’re totally comfortable at all times. Super friendly staff members provide insider tips and access to Jasper’s best, local-approved attractions, and spacious communal areas and free Wi-Fi give you a comfortable place to relax and socialize after a long day of hiking or adventuring. Compare prices for Jasper Downtown Hostel or book Jasper Downtown Hostel on Booking.com. Hostelling International has a network of hostels all over the world, including Jasper! While I’ve actually never stayed at any of the HI hostels in Canada, I’ve heard they’re super affordable and offer a great base for mountain exploration. There are three HI hostels in Jasper National Park – one in Jasper town (link to Booking.com), one at Maligne Canyon (link to Booking.com) and one at Athabasca Falls (link to Booking.com). However, I’d strongly recommend using HI-Jasper as a base as it’s the most central and accessible. For large groups or families, a vacation rentals are probably the most cost-effective places to stay in Jasper. Many of the cabins in the area are really nice, centrally located, and incredibly spacious, many with the option to sleep 4+ people. To look through and book vacation rentals or apartment shares in Jasper, I recommend checking Airbnb or VRBO for listings and availability. (If you click this Airbnb link, you can get $40 off your first booking on the platform!). For outdoor enthusiasts who want to truly immerse themselves in nature while exploring Jasper, there are plenty of front- and backcountry camping options in Jasper. What’s the difference, you may ask? Well, frontcountry campsites are generally campgrounds with drive-up access to your campsite, as well as amenities like hot showers, electrical hookups, and parking spaces. They’re typically monitored by park rangers and can either be reserved in advance or first-come-first serve. Backcountry campsites are campgrounds that you have to hike to on a designated trail. There are fewer backcountry campsites in Jasper than frontcountry, and you’ll need to carefully plan your hiking routes based on your speed and abilities. You’ll also need your own hiking gear and camping equipment for backcountry camping. For more information and routes for backcountry trails in Jasper, check out the Parks Canada website. Depending on what kind of camping you’d like to do, you may need a permit from the Jasper National Park ranger office. If you’re interested in learning more about camping in Jasper, you can see the various locations, permit requirements, and campsite reservation protocols online on the Parks Canada website. Did you find this post helpful? Bookmark it or pin it for later!